While I've been covering Woody Allen films these last few years, I haven't been that impressed by any of the posters. His last film, You Will Meet a Tall Dark Stranger, had a rather boring poster and Whatever Works' was bland, too. Now we finally have a poster that is at least colorful, though it borrows from the brilliance of another artist. 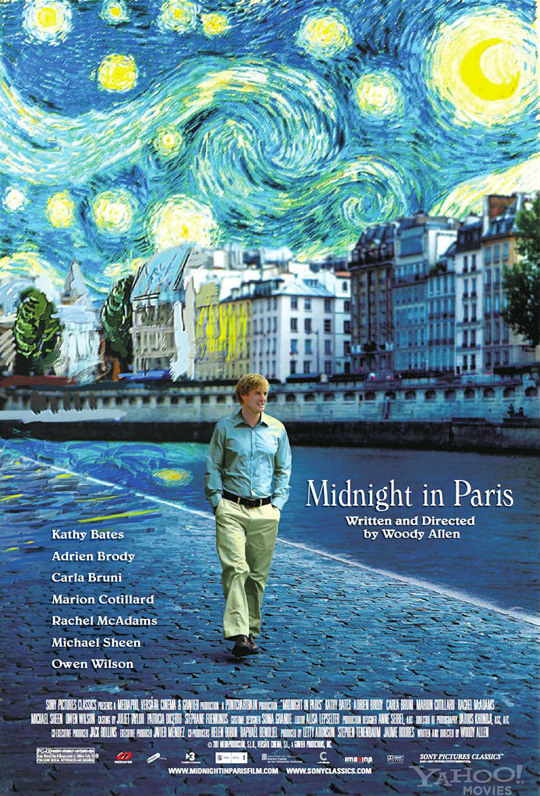 Yahoo has debuted the poster for Woody Allen's Midnight in Paris, his new rom-com with a cast of: Owen Wilson, seen strolling the streets below, Rachel McAdams, Marion Cotillard, Kathy Bates, Adrien Brody and Léa Seydoux. And if you don't know, that's Vincent van Gogh's Starry Night they're using. I like it, simple. Good to see Wilson again...and the cast is wonderful! Brody, Sheen, and Wilson! win! Bates, McAdams, Bruni, and Cotillard! Double win! It's a beautiful poster. Just don't be tempted to inspect the dodgy photoshopping too closely... It's also yet another great Woody Allen cast (even if I'm beginning to suspect that these assemblies of fine performers cancel each other out when there's so many of them), but having just watched You Will Meet a Tall Dark Stranger, I know that I need to stop expecting anything much at all from a new Woody film. Never been impressed by Owen Wilson. Wonder if he'll be the weak point here. Some kid has drawn all over the top of the poster, what a messsssss. Just joking, Van Gogh is one of my favourite loony painters. Terrific, light summer entertainment from Woody Allen. The Van Gogh poster is perfect at catching the magic the film encapsulates. Wilson and Cotillard, Bruni and McAdams are all fine. Try not to over-analyze this one. Thoroughly enjoyable and you cannot ask more from the magic lantern.